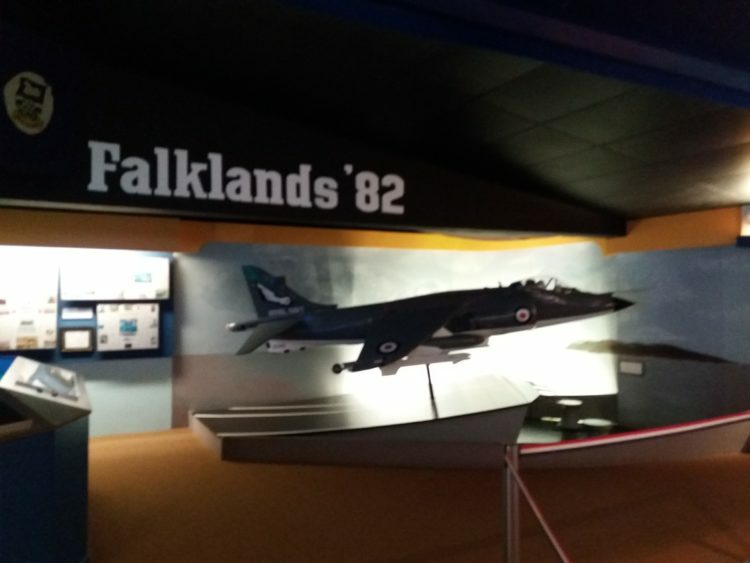 The Flambards Theme Park or Flambards Experience is almost as old as I am! The park opened in 1976 as the Cornwall Aero Park. I was 2 years old and we were actually living in Helston. My Dad was in the Navy so we got a Forces or locals discount. I also have fond memories of visiting during the summer school holidays on our annual family camping trips to Perranporth from Plymouth. It was fun to take a photo of our four children in front of the Flambards Theme Park map, forty years after the park opened! What attractions are there at Flambards? Flambards is not just a theme park with rides but an experience where you can easily spend the whole day. We took advantage of the 7 day free return and visited twice (remember to get your ticket validated). Our initial visit was on a rides day. It is important when planning your visit outside of school holidays that you check the website calender. 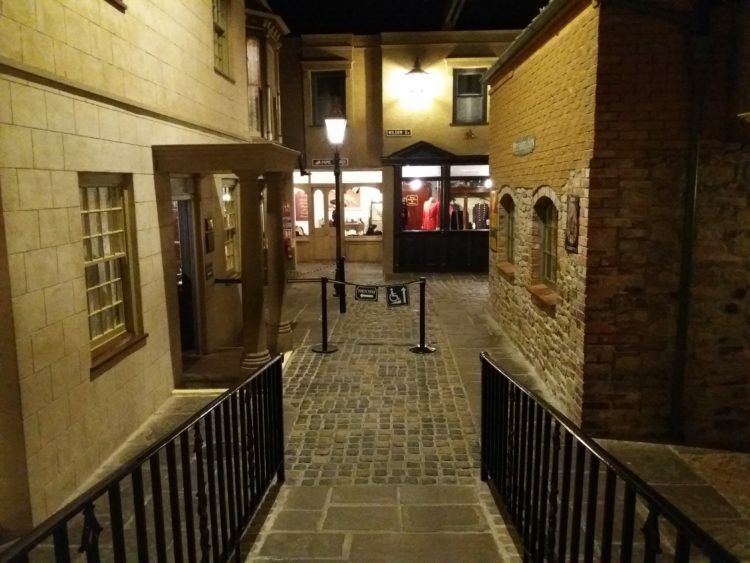 On non-ride days only the Britain in the Blitz, War Gallery, Aviation Experience and Victorian Village exhibits are accessible (the rest of the park is closed off). Height restrictions apply on some rides. 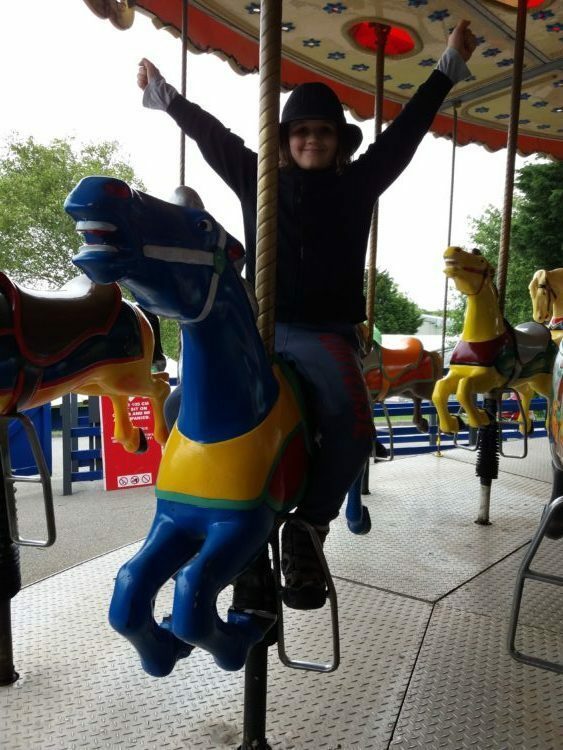 Our youngest at 4 years old was 101cm tall and there were a few rides he was not tall enough for. Sky-Force (was being installed during our visit and is the only white knuckle ride in Cornwall). Space Race – Warning! This ride contains strobe lighting effects. 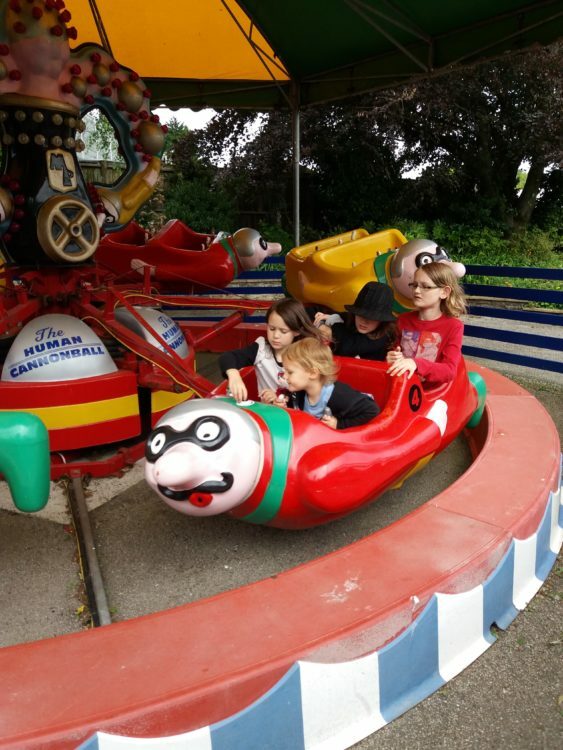 Gentler rides for the little people include classics such as teacups, a space shuttle, human cannonball, pirate ship, a rocking tug boat, a traditional carousel and the dino express. We were too busy enjoying ourselves and being on the rides to get many photos. We did manage a photo of George being peddled around on the cyclocopters. Warning: if you have any kind of leg injury do not attempt the cyclocopters as they are pedal powered with an awkward position. I did and my knees were not happy after! 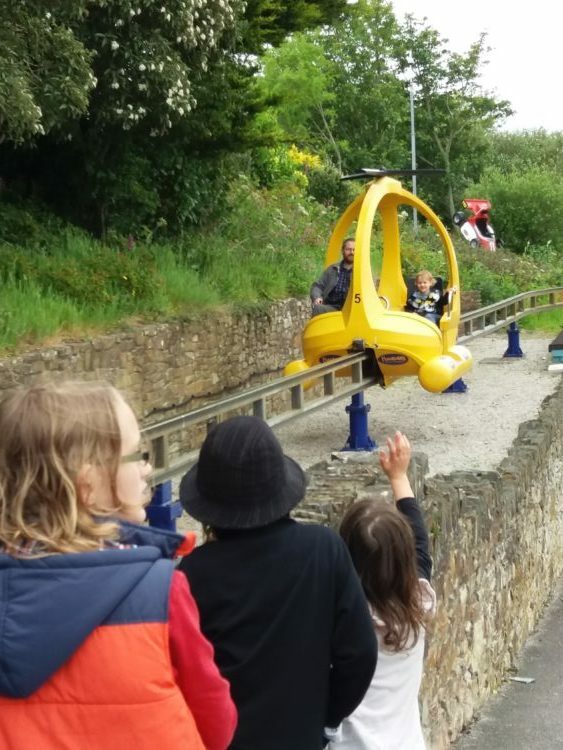 Are all rides included in ticket price at Flambards? Not all of the attractions are included in the entrance fee. For example there is a fee for the Go-Karts, along with height and age restrictions. 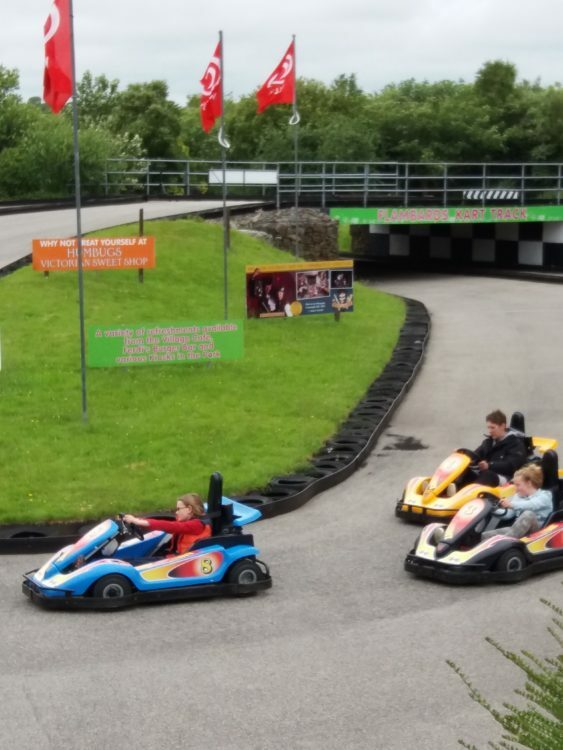 Our eldest met the height restriction for driving his own Go-Kart (red shirt in photo) and had a fabulous time. Coins are required to operate the dodgem style cars, ride-on motorbikes, remote controlled boats and mini-golf. 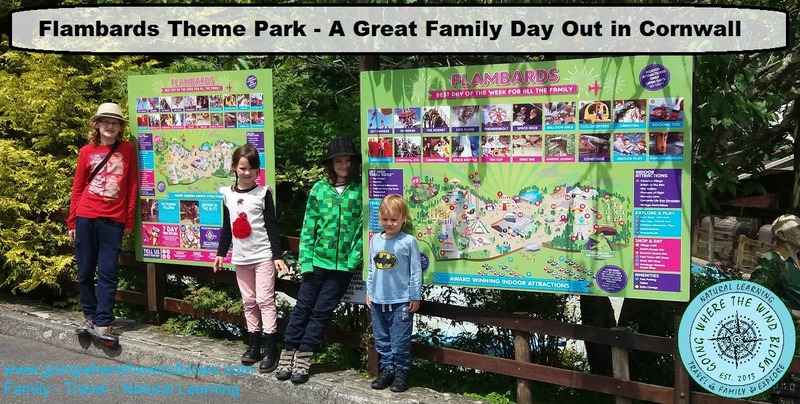 Non-motorised and included attractions: dinosaur walk, outdoor playground, indoor soft play area, demon drop (vertical drop slides) and the exploratorium. If you book your tickets online you can save 10% off the entry fee (24 hours in advance) and the ticket is still eligible for the 7 day return. On our first visit we concentrated on the rides as we were visiting during the low season so not every day is a rides day. We were not keen to visit on a weekend as generally too busy for us with our sensory issues. The 7 day return option is a great idea so we returned the following week on a non-ride day to explore the indoor attractions. There are reduced prices for seniors, disabled/carers and also family tickets. Please visit Flambards website for current pricing, discounts and availability. There are four main areas to explore when you visit on a non-rides day. 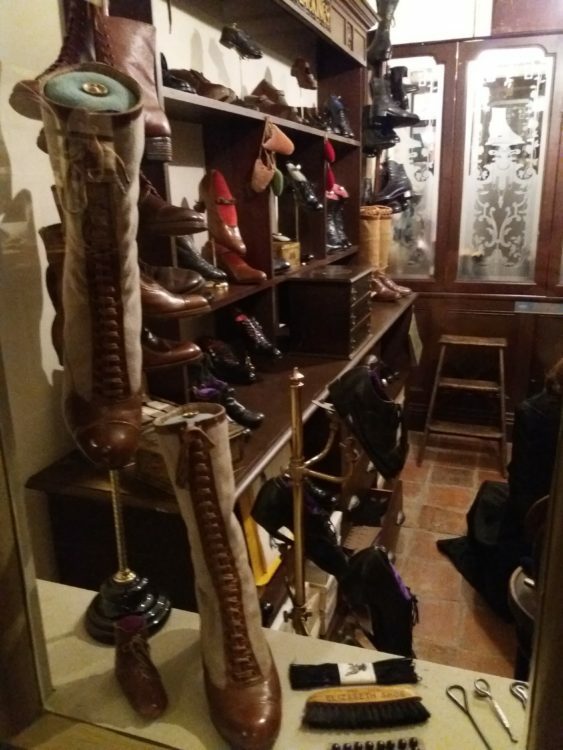 I have a soft spot for boots (hence the Victorian shoe shop image below). 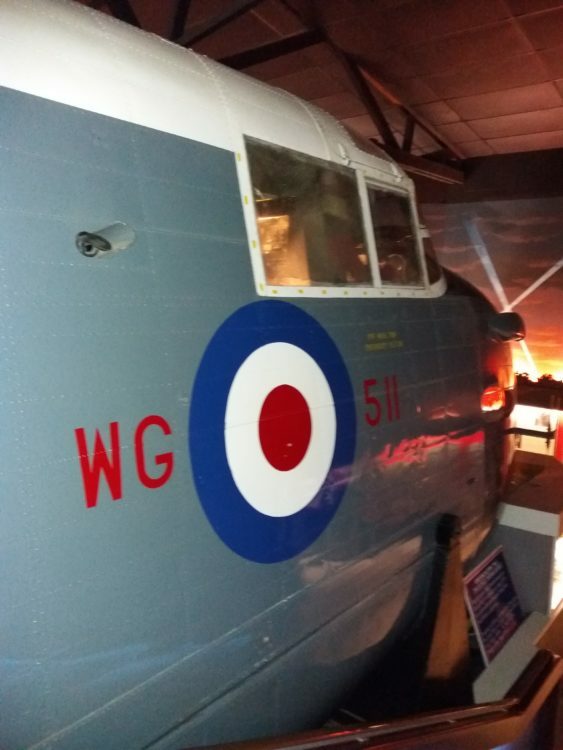 Given the choice our 4 children would have spent the entire visit role-playing in the Shackleton Bomber! The displays are very informative and visual so aspects appeal to all ages. 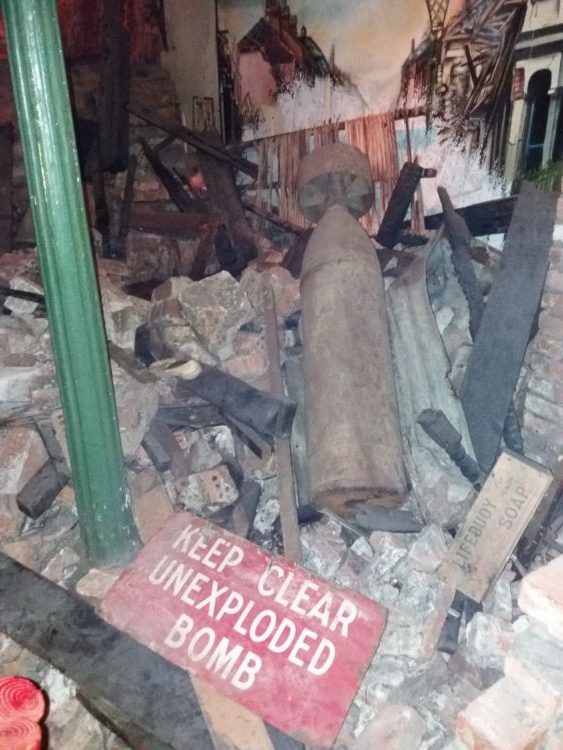 The shaking floor in the bombed house is reminiscent of the earthquake shake house in Wellington’s Te Papa museum in New Zealand, but not as violent. The time-capsule chemist shop in the Victorian Village was carefully transplanted from 1909. It is a wonderful testament to the time period and the care of the preservers. Absolutely yes! Plan your visit to maximise your money. Validate your ticket to utilise the 7 day return so you have the flexibility of more time. Choose a rides day for more choice. There are even fireworks during the summer evenings. Book online to save 10%. 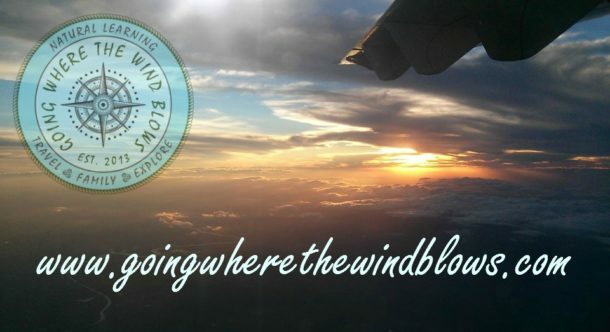 Remember to check the weather forecast, as not all rides can operate in the rain or high winds. We visited outside of weekends and school holidays so chose a rides day for our first visit. We didn’t have to queue long for rides although there were a few school groups visiting. 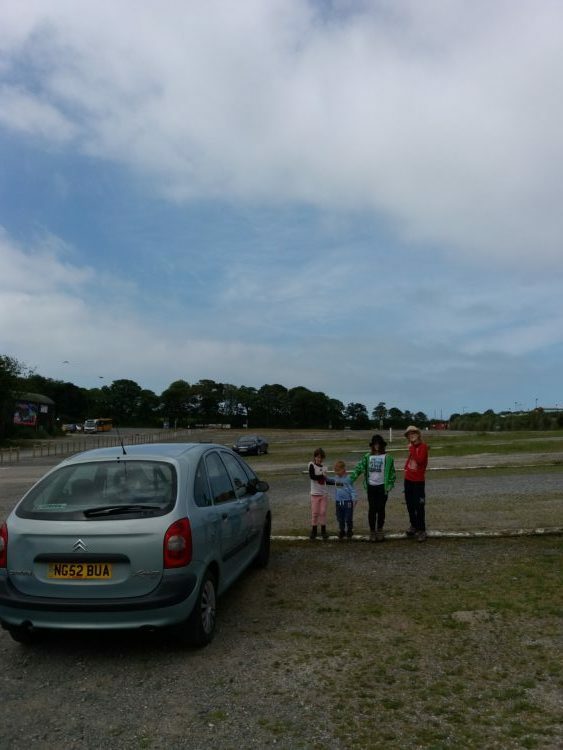 On our return day though the car park was deserted at 10am when the park opened. More visitors did arrive later on in the day – I think many wait for the weather to decide what it’s up to. One advantage of homeschooling is being able to visit places in the off-season when they are quieter. Oh and it’s much easier to find a table for 6 at the cafe. What does non-ride day mean at Flambards? We were a little disappointed on our return day that we couldn’t access the indoor play area, dinosaur walk or mini golf among other areas as they were all fenced off. I did comment in the shop to a member of staff that it wasn’t clearly communicated that only the indoor exhibits were accessible on non-ride days. We wrongly assumed that just the motion rides would be shut. We had hoped to access the rest of the attractions including the outdoor playground, demon drop and exploratorium. The conversation yielded the information that we could use our Flambards Theme Park ticket to gain entry to One 2 Eleven. One 2 Eleven is the nearby indoor soft play area – walk across the car park, keeping Sainsbury’s to your left. Off we went and spent 2 hours for free. The children had the entire indoor playground to themselves and the only costs were a couple of coffees for me and drinks for the kids! NB aimed at children aged 1 to 11 years old – hence the name. Interesting theme park of Flambards, expect to go there some day. Detailed introduction about the flambards theme park. Bring kids to this park must be great! We want to enjoy a day soon to this park. 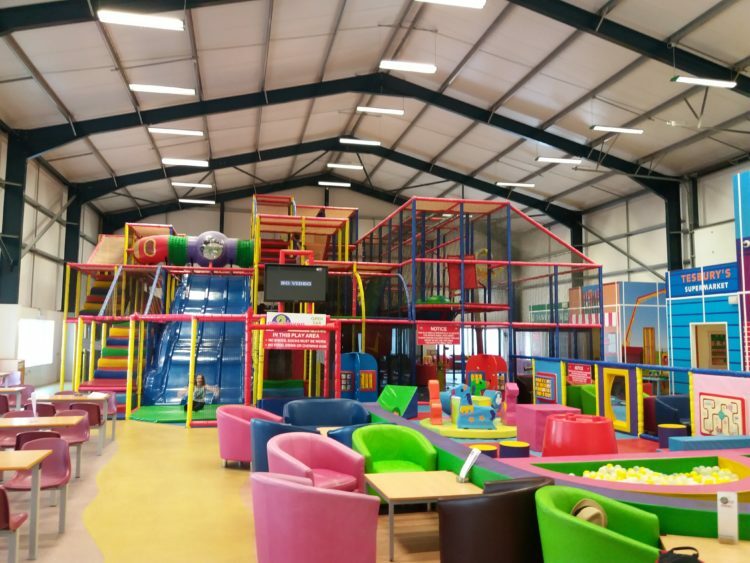 You should definitely take kids to Flambards when you visit Cornwall! I love this Flambards Theme Park and have been there many times with my families. We always fully relax ourselves there and have a good time there! I am pleased you have enjoyed your visits to Flambards. We have a plan to go to Flambards Theme Park to spend my holiday and I think I will have great fun there! My friends and I always went to the parks or seaside to have fun and relax ourselves! Wow, the Flambards Theme Park is really a park with a long history! It have a deep cultural connotation and is fairly attractive! There are so many interesting attraction there attracting me to go there! Thank you for your comment and sharing a link to amusement rides for sale.